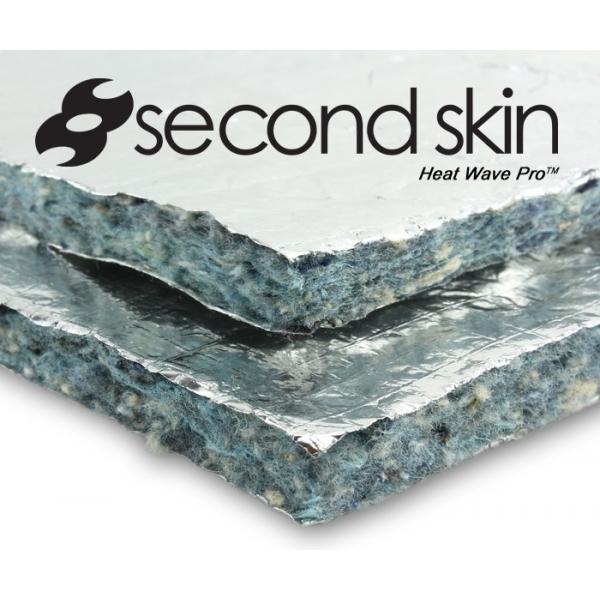 Heat Wave Pro has a reinforced foil facing laminated to both sides for extra thermal protection in comparison to normal Heat Wave. The extra layer of foil insures the most available heat reduction and insulation available from any product of its type. This thermal-acoustic barrier is perfect for reducing heat and noise generated from vehicle engines and exhaust systems. 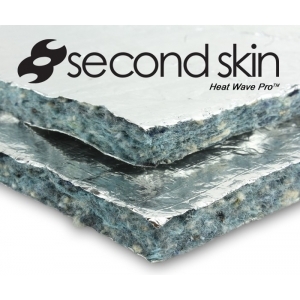 Heat Wave Pro has a reinforced foil face laminated to both sides for extra thermal protection. The extra layer of foil insures the most available heat reduction and insulation available from any product of its type. This thermal-acoustic barrier is perfect for reducing heat and noise generated from vehicle engines and exhaust systems. Apply it on top of Damplifier, Damplifier Pro, or our ceramic coating Firewall, for the ultimate in thermal insulation and heat dissipation. Heat Wave Pro is a very versatile product. When applied on top of a vibration damper like Damplifier Pro, or Spectrum it will filter out sound waves that are able to penitrate their way in to the cabin of your car. Perfect for an inexpensive way to reduce road noise, engine noise and exhaust system drone. Apply a layer of Heat Wave Pro on top of your Damplifier, Damplifier Pro or Spectrum vibration dampers to reduce the unwanted ambient noise in your car. Once you have quieted down the road, engine and exhaust system noise, your stereo volume will sound louder, clearer and less distorted. Heat Wave Pro is an amazing insulation blanket and radiant barrier. The 2 layers of foil reflect radiant heat while the natural fibers reduce convectional heat and insulate your car from extreme temperatures. Adding a layer of Heat Wave Pro on top of Damplifier, Damplifier Pro or Firewall is the easiest way to create a cool and comfortable ride. What size are Heat Wave Pro sheets? What's the difference between Heat Wave Pro and Thermal Block? Thermal Block is our best thermal barrier and is designed to face the heat source directly and can be used in exterior applications such as above the exhaust in the exhaust tunnel or under your hood/bonnet and so forth. Heat Wave Pro on the other hand is an inexpensive large sheet designed for interior use only. In fact, our Luxury Liner Pro acts as an even better thermal barrier than Heat Wave Pro with the added benefits of being a noise barrier (though it is more expensive 'per square meter'.